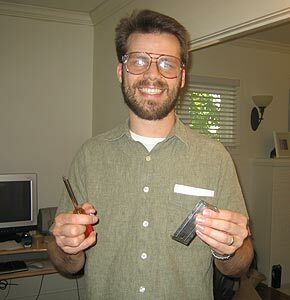 In May of 2005, I was minding my own business, repairing the keyboard drawer on my desk, when disaster struck. While I was laying on my back, drilling a hole in the underside of the desk, a speck of wood plopped down, into my left eye. Ah! That is just the worst! It was incredibly irritating. After rubbing my eye for about three minutes, I got up, walked to the sink and tried to flush it out. 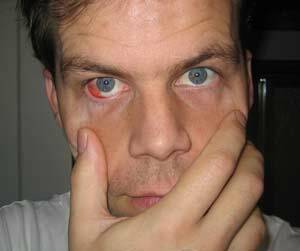 I also tried pinching my eyelid away from my eyeball, in an attempt to flush the debris out of my eye. My eye felt better when the lid was pulled away, but no matter how long I waited for my tear system to flush the particle, it would not budge! I could actually see where a tiny glob of something transparent was stuck to my eye. It was about the size of a sesame seed. I continued trying to flush it from my eye for about two hours. 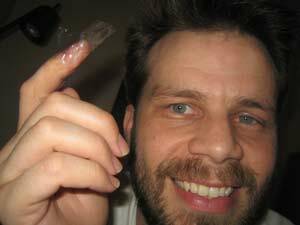 I don't wear contact lenses, so I don't have a lot of experience touching the surface of my eyeball. That all changed on this night of extreme eyeball irritation. I also tried plucking the little bump from the surface of my eyeball with a pair of tweezers. That did not work. At around 9pm, I called a helpline provided by my insurance: Ask a Nurse. The nice woman on the line suggested flushing my eye with a bunch of water, and to try picking the object off of my eyeball with the help of some adhesive tape. I'd never used adhesive tape on the surface of my eyeball before. I usually just use a Post-it. I tried it immediately. Unfortunately, that did not work either. That little glob was not budging! 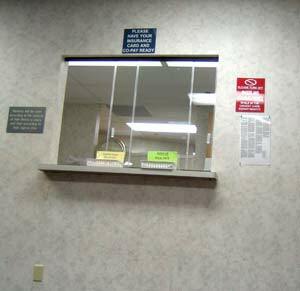 After a 3am trip to the pharmacy to buy some worthless eye-soothing medication, and some useless eye-lubricating gel, I braced myself for an early trip to Urgent Care. I arrived as they opened and I was being helped by a doctor in no time. 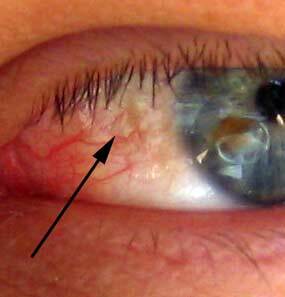 After a quick look at my eyeball, he flipped my upper eyelid inside out and found the culprit. 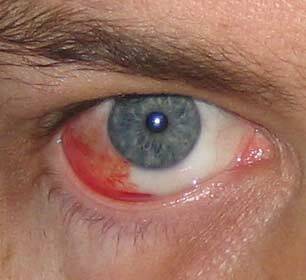 A small sliver of wood had planted itself into the inside of my eyelid, and was poking my eye from where I couldn't detect it. He tweezed the sliver out and flipped my eyelid back down. IT WAS FIXED! OH! THE JOY! I'm telling you, there is no better day to be alive than the day a splinter gets taken out of your eye! It is like winning the lottery! Before I left, he checked my vision and declared that I had 20/20 vision. Bonus. I rejoined my co-workers for a blissful day of work, and returned home to finish the keyboard drawer with an appropriate set of eye-protecting safety goggles. A few months later, after a long night formatting the perfectionist list, I did it again. As I tiptoed towards my bed in the dark, I bent over to turn on my alarm clock and felt something ram my right eyeball. There was a bright flash, followed by a horrible feeling. "AAAHHH!!" I shrieked. 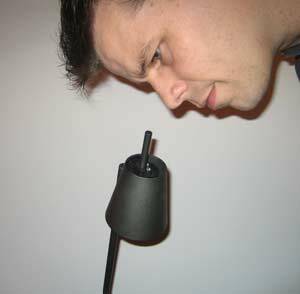 I had nailed my eyeball on the protruding rod handle of my LILLARP standing floor lamp. My eye had been wide open, so it hadn't even had the protection of my eyelid. I ran to the bathroom and peeled my hand away to get a look. I had nearly added one more rod to my eyeball. 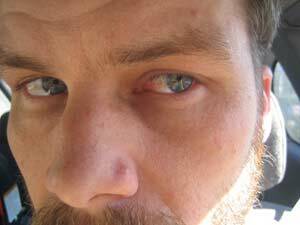 I had really battered the sclera of my right eye, as you can see in these photos taken the next morning. It looked awful, but the pain was gone after just a few hours. Another eye injury so soon after my previous lesson in safety. It was embarrassing. It was now clear that it just isn't good enough to wear safety goggles in the garage. I needed to wear them everywhere! please continue reading page two of eye protection.